ReutersA window washer uses a squeegee to clean windows on the morning of the summer solstice in New York’s Times Square, June 21, 2013. Two window washers were dramatically rescued today after being caught dangling from WTC 1. 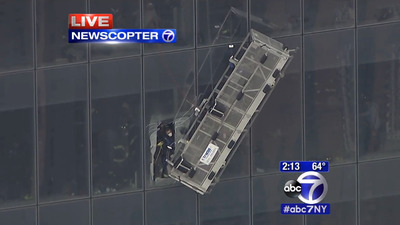 The workers were secured in the scaffolding after a cable broke and it began to hang from the building. It may be something that hundreds do every day in New York City, but don’t let the routine-ness of it fool you, it’s dangerous business working that high up in the air. 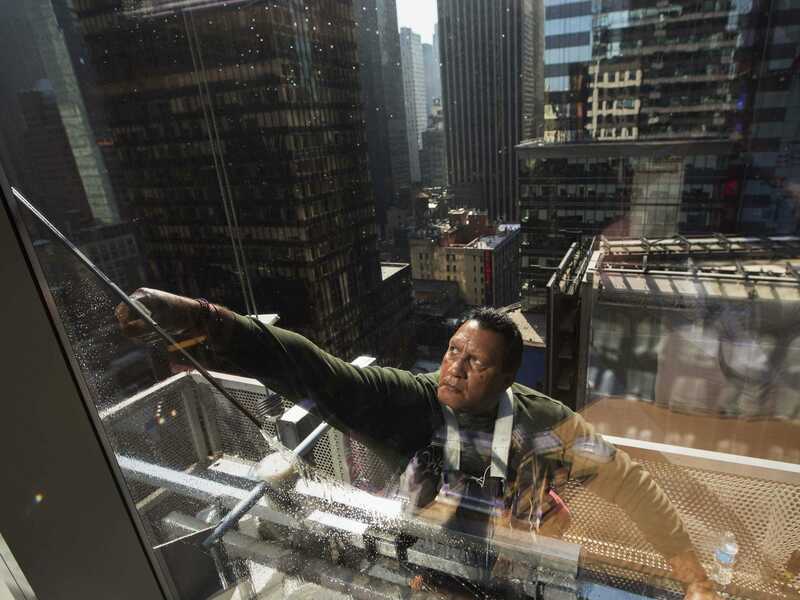 Back in February 2013, Adam Higginbotham of The New Yorker spent some time with window washers at the Hearst Tower on Eighth Avenue in Manhattan to get a sense of what their lives and work are like. It was an eye-opening article. “Having completed their safety checks, the three-man crew at Hearst climbed into the cleaning basket for their trip down the side of the tower. Bob Menzer stood alone at one end, separated from Brown and Kasparek by one of the unique features of the rig — a cylindrical turret around which either end of the platform could fold toward the other, forming a ninety-degree angle. The boom arm lifted the basket from the roof, forty feet into the air and out over the building’s parapet, and the thirty-six-and-a-half-ton roof car began almost imperceptibly to move along its track toward the corner of the building,” Higginbotham wrote. Delicate business indeed, and not for the faint of heart. And one added complication these days is the buildings tend to be much more slanted now.